This section is dedicated to Henry IV ( Part 2 ), the play by William Shakespeare. The picture is 18th century and image displayed represents the essence of the play which, we hope, will bring to life a famous scene or character from the play. The information provided in this section of william-shakespeare.info includes famous quotes / quotations, summary of the plot or story, facts about the play, a list of the cast and characters and access to the full text of the script of the play by William Shakespeare. There is much confusion when the fighting is over but the royalists defeat the rebels. More fighting ensues and once again Sir John Falstaff appears in the plot encouraging Prince Hal in his boisterous ways. The rebels are finally defeated and peace reigns. However, he dies and Hal becomes King Henry V. Hal realises he must change and becomes a sober and solemn person. Falstaff is banished from Hal's court and is lectured to also change his wayward ways. It is believed that the drama was first performed on March 3rd 1592. In the Elizabethan era there was a huge demand for new entertainment and the work would have been produced immediately following the completion of the play. It is believed that the script was first printed in 1594 although this has now been confirmed. As William Shakespeare clearly did not want his work published details of the play would have therefore been noted, and often pirated without his consent, following a performance. 'eaten me out of house and home' and 'We have heard the chimes at midnight'. Details of these famous quotes follow, complete with information regarding the Act and the Scene, allowing a quick reference to the section of the play that these quotations can be found in. "I do now remember the poor creature, small beer". - (Act II, Scene II). 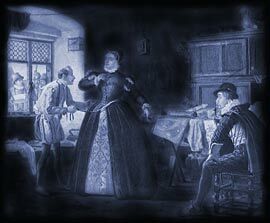 The drama was based on real people and events taken from English history. The characters are from the royal Houses of Lancaster and York.